Released in 2001, iTunes, the famous Apple software is probably one of the most used tool to create and manage media collection. And for sure, a must have for all your tracks and albums purchased on the Apple Store ! Many iTunes customers have made over years a large music collection. Probably, with long carefully made playlists ! So what about your playlists when it’s time to move over a streaming music service ? What is an iTunes playlist ? Then, the iTunes interface will read metadatas in your audio files to get title of the track, artist, album and many others information. That’s how all your audio files from different sources can be displayed in one single list like they are all in same format, same place. How can I export my iTunes playlists ? You will be able to export your playlist metadatas easily directly from the iTunes software. Then, with Soundiiz, we will be able to match these metadata to an other music service catalog to found similar tracks and recreate your playlist ! Both solutions can be used for an Apple Music playlist but if you have missing tracks with the Share Playlist link, use the export as file method. How can I import iTunes playlist to Spotify ? 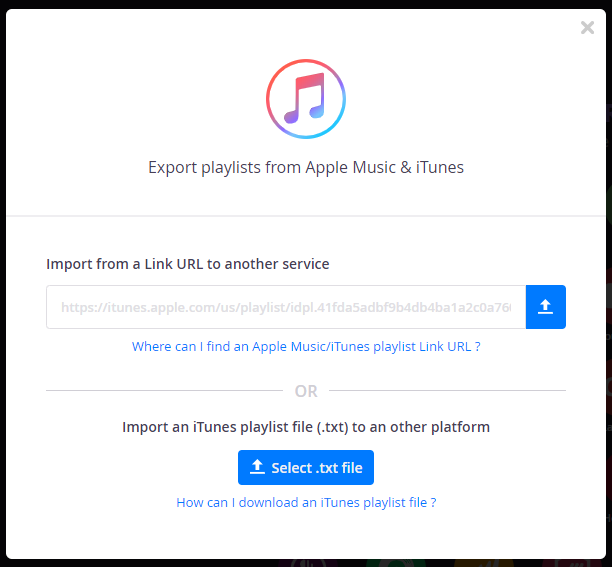 Once you have the shared link of your playlist or the playlist file (.txt) exported from iTunes, just go to Soundiiz and select iTunes in the platform list. You will be able to paste the URL link you have or upload the playlist file previously downloaded from iTunes. Then confirm the track list, choose a name and select the destination ! 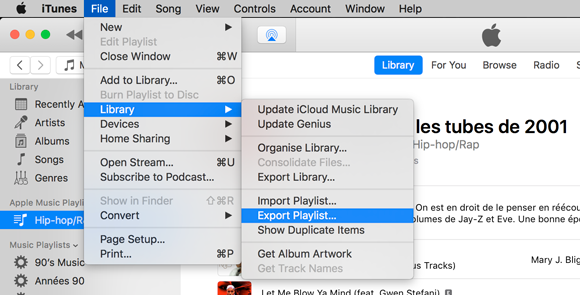 Here is a complete tutorial to transfer an iTunes playlist to Spotify. Some tracks you had in your iTunes playlist could missed in the destination catalog and so, Soundiiz will not be able to add them to the created playlist. You also can convert iTunes playlist to Google Music or to TIDAL for example ! We are currently supporting 30 music services at Soundiiz.